Convention centre with a concert hall, built 1961-1966 by Max Schlup. 1998-2002 renovations by Rolf Mühlethaler. Used for symphony concerts by the Orchestra of the Biel/Solothurn Symphony Orchestra. 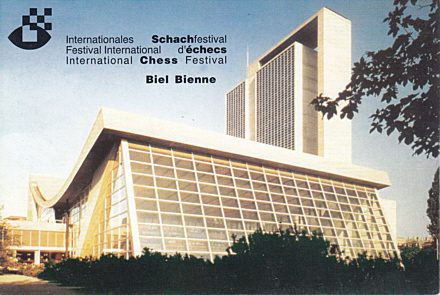 Front Text: "Intaernationales Schachfestival - Festival International d'échecs - International Chess Festival - Biel Bienne"